1. Place the items and the quantity of each item required in your cart. 2A. Print your cart as a PDF file. The procedure to print the page(s) as a PDF will vary depending on your printer. Some printers do not have this function installed. We suggest you scale the page at 90% to insure the entire page is readable. 2B. Print your cart on paper. (We suggest you scale the page at 90% to insure the entire page is readable). Scan the pages and save to PDF file. 3. Save the PDF file to your chosen folder. 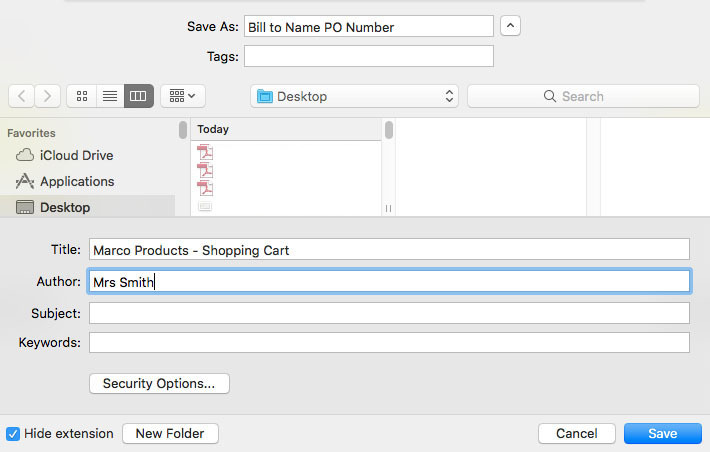 Changing the "Save As: or File Name:" to your POs BILL TO NAME & PO # (If you have it). 4. Attach the CART PDF and email the request to your purchaser. Remind your bookkeeper/purchasing agent to add the appropriate shipping (see below). Processing can be delayed with POs that do not include correct shipping. 5. E-mail the PO to Marco. 6. A customer service representative will email you a confirmation of your order. If you do not receive a confirmation within one week, please call 1-800-448-2197 to assure your order was received and is being promptly processed.